Automatic generation has been additionally optimized to give you the best results when working on challenging timetables. Thanks to the latest and ever advancing web technologies automatic generator works equally well in any modern browser: Chrome, Firefox, Safari, Edge or Opera. Explore different timetable solutions and safely revert changes at any time using the new History panel. Customize the number of remembered states in the options. By default, the last 100 states are remembered. Timetables are stored in the new 2.0 format and the app consumes new RESTful APIs enabling a much easier integration with other apps. Old timetables can still be imported by choosing Owl > Open > Open from File. The term "activity" is now used instead of "lesson". Subjects, teachers, classes/groups and rooms are displayed using full names in the activities grid (switch to short names by clicking "Total" in the statistics above the grid). Similar activities are not longer grouped together which allows organizing activities any way you like. Group sets and groups are redesigned to appear more grid-like so you can control the order of group sets and their groups using up and down arrows in the bottom right corner of the grid or copy group sets to other classes using Copy button. Collaboration is further improved so the timetablers can simultaneously work on the same resource within a timetable and all saved changes will be seamlessly synced and merged across any device you or your colleagues might be using. Custom periods can be reordered by moving them from one default period to another using up and down arrows in the bottom right corner of the grid. Merge two timetables will additionally merge custom periods, groups and forbidden, unwanted and mandatory positions. Grid sort will immediately refresh the view. Use the new History panel to undo sort. Some windows, e.g. manage data or customize cards are non-modal now, so you can drag cards, switch views and similar without having to close them. Subject difficulty is set to medium by default. Check for the same short name is removed when importing activities. When you click the open icon multi-select in the grid is enabled so you can delete more timetables at once. Newly added cards have scheduled room(s) if desired room(s) are set. Experienced timetablers might want to uncheck "Show tips" option which is checked by default. Software is built using the latest web standards and therefore the old plugin app and support for Internet Explorer 9 and 10 has been removed. Although Internet Explorer 11 is still partially supported, consider installing a more modern browser instead. Lots of bug fixes, such as pinned unscheduled cards which can now be used in combination with clipped cards without causing any issues. It takes only about half an hour to watch 10 free videos packed with tons of helpful info so you can be more productive with your scheduling tasks. Watch getting started videos now and subscribe to our YouTube channel to get the latest video tutorials for free. Videos are only a couple of minutes long and cover basics as well as some tips & tricks. Experience state-of-the-art scheduling software, with a blazing fast automatic generator, real-time notifications and extra views, revamped design, efficient managing of lessons/cards, teacher substitute, 10 skins to choose from, share to social networks, export to Excel/Sheets, plus more. A brand new Prime Timetable is a perfect match for schedule challenges, making you more more productive on any device you choose. Head into Owl > Options and choose your favorite blue, green, red, violet, orange, pink, cyan, brown, gray or dark skin. Additionally, you can choose any color you want for the card background. Adding lessons to classes on the same grade level or same subject teachers can be cumbersome. Instead you can add lessons for only one class and then copy/edit cards for other related classes or leave the desired room empty and assign teachers to their homeroom later to speed up the process. Select any number of cards and edit all of them at once to substitute teachers or any other resources. Easily share master or individual schedule to Facebook, Twitter and Google+ by choosing Share > Social Networks. Additionally, choose Share > Embed Timetable to generate necessary Html code to insert the schedule into your school's website or blog. Once the schedule is finished choose Save as > Html Spreadsheet(s) to export master or individual schedule(s) as a table to Microsoft Excel or Google Sheets in case you need additional tweaks for your schedule. Add your ideas to online user voice or give us a feedback by sending email. We wish you happy scheduling! All modern browsers are perfectly suitable for everyday use, but when it comes to web apps and especially intensive calculations like automatic timetable generation, they give drastically different results. It turns out that by using Chrome, the performance of automatic generator is 2-100 times faster than in any other modern browser, fully reaching desktop application performance on the web! 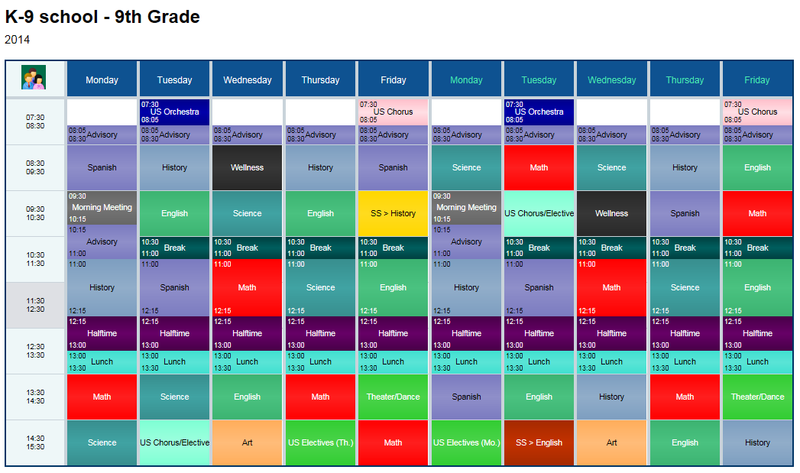 If you don't already use Chrome for your timetabling work, we recommend that you give it a try. The generator will work considerably faster in Chrome than in our plugin app, a couple of times faster than in Firefox and sometimes even 100+ times faster than in Internet Explorer 11. When it comes to performance, we have a clear winner: Chrome. The second best is Firefox and then comes Safari. If you are using Internet Explorer, we highly recommend that you avoid using it for any kind of complex school scheduling (although we do have high hopes for Microsoft's new browser called Edge). Please note that all browsers are still supported, even the 14-year-old Internet Explorer 6 via the plugin app. However, if you want the best performance, use Chrome and reward yourself with blazingly fast automatic generation! Ow(l)ing to your generous feedback and support, we have added tons of timetabling features ready for you to use as of today! New Prime Timetable enables even more timetabling scenarios and performance improvements that you can enjoy on any device you might be using: Mac, PC, tablet or smartphone. No plugins, no installation, it just works! Sounds interesting? Read on. By utilizing the power of the latest modern browsers we have been able to drastically improve automatic generation performances. Just click play icon and enjoy automated scheduling at its best. Use Firefox, Chrome or Safari for superior experience. If automatic improvements have no progress after a minute or so, it's time to revise your data or constraints. Feel free to get in touch with our customer support at any time by choosing Help > Contact us. The newly redesigned notification system will instantly warn you upon any change with updated notification number appearing in the top right corner. Clicking the bell icon will open a current list of all errors and warnings. If needed, some notifications can be ignored by pinning related cards. If the new option Allow subject to be taught more than once per day is checked, you won't be notified if the subject is scheduled more than once a day. When you set desired maximum number of lessons in a row for a teacher, the automatic generator will try to resolve this requirement and a notification will warn you if some of your staff is teaching more than allowed number of consecutive lessons. In order to better organize and group rooms, you can now specify room capacity, room tags, e.g. "1st floor, lab", and building name. That way, when adding alternative rooms for the lesson, you can easily select all rooms on the 1st floor or all rooms with specific capacity/tag. After entering building names for rooms, set Allowed daily number of moves between buildings to minimize moves for staff members and let the generator do the magic. Additionally, the software can ignore teacher moves after the window. Displaying large timetables is 3 times faster. Pinned cards have pin icon in the top right corner. Awaiting cards are displayed in several rows in the individual view and when an awaiting card is dragged into the timetable, others are automatically reordered. Saving changes while there is no internet connection is supported. Lots of smaller fixes and updates for iPad, iPhone and Android devices. If you are currently using our plugin app and want to try new features, just select web app by choosing: Help > Options > Preferred App. Hope you like the new improvements, and don't forget to give us a feedback, send us email or add your ideas to our online user voice. Happy scheduling! Surprise your students and colleagues with all-new Prime Timetable, reimagined and rebuilt from ground up to work on any device. Beautifully optimized schedules are now just a tap away on your tablets and smartphones. No installation, no setup. It just works. Visit primetimetable.com to create a free account (if you haven't already), log in and enjoy scheduling like never before. Prime Timetable is still the only app in the global market fully accessible both online and offline, and now we have taken a giant leap forward by making it accessible wherever, whenever! Seeing is believing. Therefore, we have made a video showing automatic generation, instant validation, manual adjustments, dragging cards with just a touch of your finger and sharing schedules online. And all this on a pocket size phone! The results are groundbreaking. Watch the video. When you tap/click the class or teacher's name in the master schedule, an individual schedule is opened. Anyone can bookmark that page to the home screen of iPhone/iPad or Android smartphone/tablet, or pin that page to the start menu on Windows Phone, or create a web shortcut on Mac OS X, or just put it in the browser's bookmark/favorites for easier access. Whatever you or your colleagues/students prefer. Once a colleague or a student has visited the published timetable they will be able to see it again any time they want and without internet connection! The master and all individual schedules are accessible offline. Even if you are stuck in the traffic without Wi-Fi, your schedule is always there. Again, no installation, no setup. It just works. Choose Help > Options > Preferred App and pick the app that best fits you. The web app works everywhere and will be automatically opened if you visit primetimetable.com using tablet or smartphone. The plugin app is available even offline as a desktop app and is up to 3 times faster when it comes to generating complex school schedules. Both web and plugin apps are available at the price of one. Plus, we offer special discounts (up to 50%) for multi-year purchase. Check plans and pricing and choose the plan that suits your school. Your invaluable feedback has helped us enormously to improve the application, and so far we have implemented more than 200 ideas that you have requested. We are truly grateful for your generous support and would like to invite you to share your experience with Prime Timetable and spread the word so that others can get their schedules done and have fun! Visit our brand new website for more info and enjoy scheduling like never before. (B) Lessons that are held over one week but not the other. All other variations boil down to these (A) and (B) types. For instance, there could be a lesson occurring 1.5 times per week, which means there are two lessons in the first week and one in the second. In that case one lesson is type (A) and the other (0.5) is type (B). Create a new timetable with 5 days. Add all type (A) lessons using Manage > Lessons > Add. Generate the timetable using play icon. Pick the red marker and click once again on Friday to remove the forbidden positions. Click all other days to forbid lessons on Monday, Tuesday, Wednesday and Thursday. Save two copies of this timetable: Week 1 and Week 2 using Save As > Copy of Timetable. For each timetable add type (B) lessons and generate the timetable again. Of course, there are many more variations but the procedure is similar. Choose Share > Publish to the Web > Publish. Configure publish options, such as displayed view, skin and time format. Share the published link with your students, colleagues and anyone interested, e.g. put the link on your school's website, share it on your school's Facebook page, or just send the link to other colleagues in the email. When you click or touch the first column in the master schedule, individual view is opened and the link in the browser is changed. That means that anyone can bookmark their individual schedule to the home screen of their iPhone/iPad or Android smartphone/tablet, or pin the website link to the start menu on Windows Phone, or create a web shortcut on the Mac OS X, or just put it in their browser's bookmark/favorites for easier access. Whatever you or your students and colleagues prefer. No Wi-Fi? No problem. View schedules offline! Once a student or a colleague has visited the published schedule, they will be able to see it again any time they want even without internet connection. Yes, the whole school schedule and all individual schedules are accessible offline. Even if you are stuck in the traffic without Wi-Fi, you will be able to see your schedule as well as everyone else's! Accessible on any device. No installation. No plugins. It just works! Virtually any device, browser or OS you or your colleagues and students might have is supported! We have really gone extra mile here; even the 13-year old Internet Explorer 6 is supported. Of course, the latest and greatest browsers are capable of so much more, as they do animations, display nice rounded corners and linear gradients in the back of the card, and generally enable better user experience. You can define custom period intervals and appropriate cards will be repositioned and resized accordingly. This way you can publish highly flexible schedules like in this image. Don't worry if you need to make changes to an already published schedule. All student and teachers schedules will be automatically updated once you save changes, so everyone gets an up to date schedule. We are sure your students and colleagues will love beautiful schedules on their phones, tablets or any other device. Enjoy school scheduling like never before! Take a couple of minutes to watch this groundbreaking video completely shot using only a pocket sized smartphone. The video speaks for itself. Prime Timetable is available on Mac, PC, tablet, phablet, smartphone, on iOS, Android/Linux, Windows Phone OS... and most probably on any future device. Well, any device which supports web standards. From the largest desktop monitors to the smallest phone screens, portrait or landscape orientation, from mouse and keyboard as input to finger touch and pen, Prime Timetable is accessible whenever, wherever. And now excuse us for a moment, we are going to have a big pint of beer and celebrate :). Cheers! Stay tuned and enjoy school scheduling like never before!